RealAccounting , 17 Mar 18 The incessant statement that nuclear is “carbon free” is untrue, and the nuclear industry knows it. The carbon footprint of a standard nuclear plant is in its construction and infrastructure. Many tons of concrete; google the carbon footprint of cement. Then the fossil fuel needed to dig up, crush, size, wash and transport aggregate for the concrete. We’ll ignore carbon costs of acquiring and pumping water for the concrete, at this point. Then steel. Many tons of steel; much of it specialized, using manufacturing processes that use 2-5x more heat (coal/coke) than plain mild steel. Mining. Smelting. Forming. Ore transport. Steel transport. All done with fossil fuels- not zero. Then there’s operating staff. A 2.2 MW coal plant has about 350 employees. Three Mile Island has 675. Numbers for maintaining/operating wind and solar plants are wildly variable, since so much depends on size and site at this point; but you understand that taking care of an installed wind or solar plant is a job for a very few technicians. 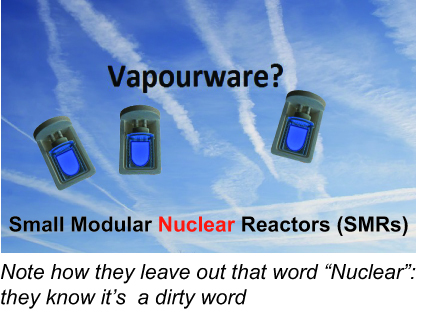 Are these NuScale nuclear power stations REALLY tiny? ……..Among U.S. developers, NuScale Power of Corvallis, Ore., has surpassed its competitors — including Holtec International of Camden — to advance its design closer to the finish line. Supported with $275 million in U.S. Energy Department grants, NuScale has invested about $800 million to design a 75-foot-tall cylindrical reactor that the Nuclear Regulatory Commission is expected to approve next year. NuScale aims to begin producing power at its first plant in 2026. ……. not everyone is sold on their promise. Small modular reactors are factory-built, contain fewer mechanical parts, and are designed to be installed underground with passive cooling systems that are “inherently safe,” the industry says. SMR designers say the plants will need fewer operators, and because the design is safer, they have also asked the NRC to reduce the 10-mile emergency planning zones now required for larger commercial reactors to an area confined to the plant site. Critics such as the Union of Concerned Scientists have opposed the request, saying the plants and their accumulated on-site spent fuel still pose a significant risk. “They argue the reactors are so safe that terrorists won’t be able to effectively cause a massive radiological contamination event, and I beg to differ,” said Lyman. The initial markets for SMRs are expected to be primarily overseas, where electricity costs are higher and nuclear energy can compete, NuScale says. Some water-starved Middle Eastern countries have expressed interest because some units can be configured to produce steam, rather than electricity, to power a nearby water desalinization plant. many environmental advocates fiercely oppose any expansion of nuclear energy’s role, including skeptics who cite safety issues exposed by the accident 40 years ago this month at Three Mile Island Unit 2 in Pennsylvania, which put the brakes on the industry’s growth in the 1980s. In the last 20 years, just one new commercial plant has begun operations in the United States, and only two are currently under construction. Nuclear power’s cost is at the heart of a debate that officially launched in Pennsylvania last week with the introduction of a proposal to give the nuclear industry $500 million in annual subsidies, paid by electric customers. Nuclear operators have threatened to shut down several Pennsylvania reactors because they are unable to compete in low-price electricity markets awash in cheap power from natural gas plants. Exelon Generation says it will shut down Three Mile Island Unit 2, located next to the partly dismantled Unit 1, unless state lawmakers come to the rescue by June. ……. 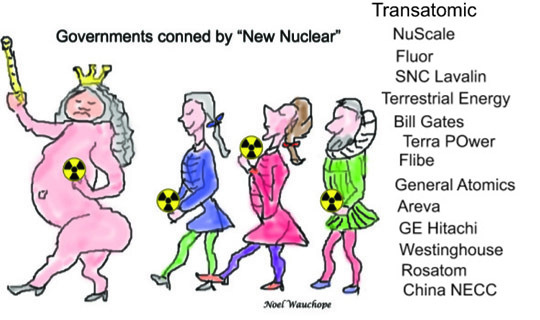 Dozens of companies are working to develop new nuclear reactors, including so-called Generation IV reactors that are cooled with such materials as molten salts, inert gases, or even liquid metals. Several companies have focused on developing SMR designs. Holtec International, a private company in Camden whose core business is managing spent fuel at nuclear reactors and decommissioning old reactors, has developed a 160-megawatt reactor design it calls the SMR-160. The project’s status is unclear, and Holtec did not respond to written questions. “I haven’t seen evidence of it really advancing,” said Lyman, of the Union of Concerned Scientists. Westinghouse and BWX Technologies Inc., which both have long histories of building reactors, abandoned their SMR projects. NuScale in September chose BWXT to build its SMR. BWXT, which built many of the small reactors used to power U.S. Navy ships and submarines, plans to subcontract component manufacturing to Precision Custom Components of York, Pa.
Lyman said that he is worried that multiple modular reactors would fail in NuScale plant, but that the NRC will accept more risk because it is under pressure to not impede the licensing process. US DEFENCE Department plans to build mobile nuclear reactors capable of powering their battlefield bases could trigger another world war, an eminent scientist has warned. By TOM FISH,Mar 9, 2019 The US military is fighting wars on at least 11 fronts, from the middle East to Africa. And all that cutting-edge equipment and military personnel can consume vast amounts of energy. But the US Defence Department’s announced intention of building an array of mobile nuclear reactors to power its way to victory has been slammed as incredibly dangerous – and could even trigger another nuclear war. The US army is keen to end its dependance on fossil fuel deliveries to forward operating bases, situated close to conflict zones. Speaking exclusively to Express.co.uk, Dr Lyman said: “The military generally use diesel fuel that has to be trucked in, creating supply vulnerabilities. “So they would love to have a constant supply of electricity which does not require these frequent shipments. “And they think nuclear power can provide that. The Defence Department has requested tenders for nuclear reactors capable of producing between one and 10 megawatts of electricity, weigh less than 40 tonnes, and can be transported by ship, truck or C-17 aircraft. And it would have a so-called “inherently safe design”, ensuring a meltdown is physically impossible in various complete failure scenarios. However, Dr Lyman, a scientist with several decades in the field, believes it is naive to expect a such nuclear reactor to be safe in the middle of a war zone. He said: “It is foolish for the US Department of Defence to assume there are reactors that cannot meltdown and devastate their bases with radioactivity. The nuclear scientist believes these nuclear reactors would be a target for terrorists, and a direct strike could disperse that hazardous radioactive enriched uranium that could damage the safety systems preventing the reactor from melting down. Dr Lyman said: “I expect in a worst-case scenario you would have an area of many tens of kilometres that could be contaminated to the extent where the land would be unusable without being decontaminated. “And anyone at the military base at that time would be exposed to potentially lethal doses of radiation. The nuclear scientist believes the US military response to such a devastating nuclear attack on its armed forces could trigger a like-foxlike reaction. “If you bomb a fossil fuel installation it would not be pretty, but there would be a significant escalation if a nuclear plant was hit. He said: “There could be a number of disadvantages, both to military forces and also to the countries where the reactors would be located. “The US military could end up leaving a radioactive mess for other countries to deal with. There is precedent for this, when the US military dropped nuclear weapons off the coast of Spain and in Greenland. “The US left a radioactive legacy in both countries for decades. Off-the-shelf nuclear reactors seek buyers, Climate NewsNetwork March 5th, 2019, by Paul Brown The nuclear industry’s fierce fight for survival is leading several countries to develop smaller, off-the-shelf nuclear reactors. The idea is to place the SMRs close to where they will provide power so that if necessary they can provide district heating as well as electricity, or − if on the coast − seawater desalination. They can also be deployed on barges and towed to remote locations to provide power for island communities or military installations where ordinary grids cannot reach………. 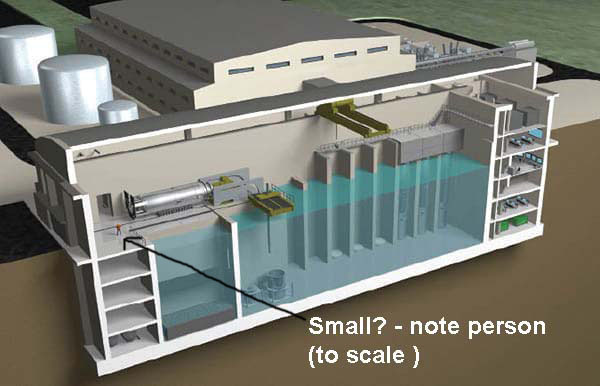 For all their innovations, NuScale Power’s small modular reactors remain conventional in one way: They would use ordinary uranium-based reactor fuel that’s meant to be used once and safely disposed of. But for decades, nuclear engineers envisioned a world powered by “fast reactors” that can breed an essentially boundless supply of plutonium that can be reprocessed into fuel. Early in the atomic age, experts believed nuclear energy would one day supply most of the world’s power, raising the specter of a uranium shortage and boosting interest in fast breeder reactors. However, the reactors are complex and must be cooled with substances such as liquid sodium or molten salt. The chemically intensive recycling process produces plenty of its own hazardous waste. And the closed fuel cycle also would establish a global market for plutonium, the stuff of atomic weapons, raising proliferation concerns. Perhaps most important, the world is in no danger of running out of uranium. So some experts doubt fast reactors will ever become mainstream.